Is there anything left in the tank for further gains from these stocks? Find out. Bull markets in stocks can last a lot longer than investors would ever imagine, and at eight years and counting, the current favorable period for the market has created a lot of winning companies. Gains for the broader market have been steady and consistent, but some individual stocks have launched much steeper climbs to much better performance. Electronic Arts (NASDAQ:EA), CoreSite Realty (NYSE:COR), and Align Technology (NASDAQ:ALGN) have all tripled in value in just three years, and investors looking at the three success stories want to know if there's more money to be made in the shares. Here, you'll learn more about these stocks and what lies ahead for the companies. The video game industry has changed a lot over the years, but players still want top games they can enjoy. Electronic Arts has delivered on that front, with powerful franchises such as its Battlefield and FIFA series. Like many of its peers, EA has thrived when new gaming consoles become available, taking advantage of greater capabilities to show off its creative vision. Yet to an increasing extent, Electronic Arts has made the transition to mobile gaming, and that has increased the amount of digital revenue it can collect on a regular basis to make its financial results smoother and less lumpy from big game releases. Even after such a solid run, Electronic Arts could have further to climb. Televised sports video gaming has started to take off as content providers seek ways to connect with younger audiences, and that could boost the popularity of EA's Madden football franchise along with its extensive lineup in other sports. Electronic Arts has also done a good job of increasing its profit margin by taking advantage of lower-cost digital distribution over physical game sales, cutting out retail intermediaries and keeping more for itself. With business and creative success, EA is still in good position to keep winning for shareholders in the future. Most real estate investment trusts invest in things like office buildings or retail shopping malls, but recently, real estate investors have gotten an opportunity to move into the high-tech world. Data-center REITs such as CoreSite Realty have tapped into demand for cloud computing assets by focusing on the locations at which massive data storage centers operate to meet the information technology needs of their users. CoreSite in particular is relatively small, with fewer than two dozen operational centers in eight different markets within the U.S., but it already has relationships with major players in the technology industry to provide for their data center real estate needs. CoreSite also expects to accelerate its growth in the future, and based solely on its current pipeline of expansion, the REIT hopes to boost its available square footage by nearly half in the coming years. CoreSite shareholders can collect an impressive dividend yield of 3.4% in addition to their share-price appreciation, and that makes the real estate investment trust an interesting play on the future of technology. Finally, Align Technology has done an excellent job of meeting the need for orthodontic services. With its Invisalign clear tooth alignment devices, Align has challenged traditional braces successfully, and customers haven't hesitated to use the alternative to metal brackets in choosing between treatment options. Align shows few signs of slowing down. In its most recent quarter, the company reported a record number of shipments, climbing to 208,000 cases. International volume now makes up almost two-fifths of Align's overall business, and the company can also boast greater utilization across the orthodontic industry. With expectations for demand to keep rising, Align Technology just needs to keep successfully executing on its current opportunities to sustain its recent success. 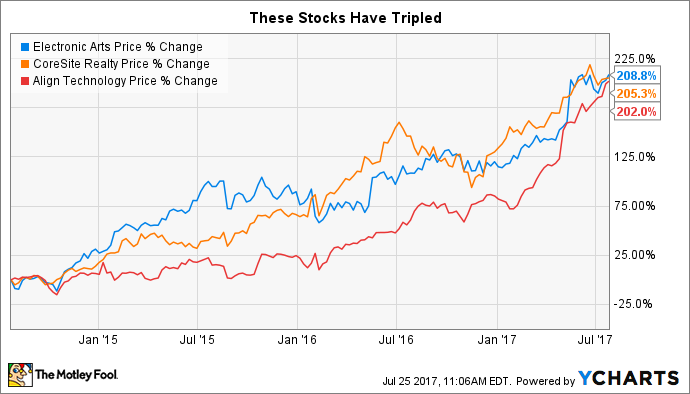 Few stocks triple in just three years, but these stocks have what it takes to create that kind of growth. Given their favorable prospects for the immediate future, further gains are quite possible for shareholders in these three stocks despite their impressive past run.